Taichi is an ancient Chinese spiritual practice which stimulates the flow of subtle energy – which in Chinese is called qi (pronounced chee) -- within the body. Chinese believe that all human activities from art to fighting are energized by the dynamic presence of qi. The cultivation of this qi is called qigong -- energy practice, a study of energy in the body/universe. Qigong has been practiced for over two thousand years and benefited hundreds of millions. In doing Taichi, we will learn how to breathe, meditate and cultivate our inner strength and spirit. Because of its emphasis on focusing the mind and its graceful movements, Taichi is also called moving meditation and cosmic dance. In India, qi is called prana. The different methods which India developed for its cultivation make up the practices of yoga. These have developed in a quite different way as Taichi in China. Taichi is a form of qigong, which is the science and discipline of cultivating awareness of subtle energy (qi) within the body and applying this powerful energy for enhanced health and well being. Qigong is also the basis for all Asian martial arts. The great masters of Taichi and qigong devote their entire lives to its cultivation. An immense amount of knowledge about qi has been accumulated in China over more than 2,000 years. For this reason, many books on the subject are quite detailed and complex, sometimes discouraging beginners. However, the basic principles of Taichi can be learned quite easily. In this workshop, you will learn a series of exercises called The Eight Pieces of Brocade. Though easy to perform, these can form the basis of a valuable spiritual practice. The movements are gentle but invigorating. They can be done by people of any age or health status. This is a circle divided into two parts, one black and the other white. The black half circle represents yin (feminine) energy while the white circle represents yang (masculine) energy. Chinese believe that since everything in the universe is composed of these two energies, the world will only be in harmony when they are in balance. That is why within the black half-circle there is a small white circle and vice versa. These two contrasting dots are seeds of energy that drive the cycle of yin and yang in its circular movement. Taichi, with its practice in circular movements, teaches us a way to achieve this balance and harmony in our own lives. Laozi: First there was nothingness which evolves into motion, which in turn creates yin and yang. Since yin and yang are always moving, the goal of Taichi is to find a balanced point within motion in order to create and sustain harmony. Since all balance is created from change, we should strive for balance yet be ready for change. Why Taichi is Good for Writers? Writers are emotional, creative, and energetic creatures. The process of writing -- starting from putting down your first word onto a clean sheet of paper to the finished product of several hundred pages -- takes tremendous energy, concentration, as well as perseverance. Those who are filled with energy, or qi, will persist to the very end. While those who lacks energy will throw down their pen, or walk away from the computer screen, and give up. In creative work, energy plays a vital part in contributing to success. Not only that we need the energy to write and re-write (many many), we need even more energy to get our “pretty baby” out to the world so that it will be fully appreciated, admired, and loved. Therefore in writing, having talent is just the beginning, along the long, meandering path to success, we need qi, lots of them. Fortunately, although computer and ink cartridges are expensive, energy is free. Not only that it is free, it is everywhere in the universe. It all depends on whether we know how to take it from our surroundings. As writer, we are solitary creatures. We live in our imagination. We interact with the computer screen. We make friends with characters in books. We fall in love with someone else’s imagined lovers/spouses. And we sit long hours without moving. While these are all good and bad, having abundant energy is all good. The simple qigong and Taichi exercises taught in this workshop will enable us to move with qi after hours of sitting. After the first two lessons, we will be more aware of not only our own energy, but also those surrounding us, and ultimately, the qi emanating from the whole universe. The energy that we gained through the simple, graceful movements of our body will help focus our minds and energize our writing. I have been practicing Taichi for more than a decade. All my creative works, especially writing, benefit from my gentle, graceful movements filled with subtle energy. Through Taichi movements, I learn not only concentration and awareness, but also creativity. I am constantly amazed that how creative we all are and how – only if we let our bodies relax so as to absorb the empowering qi surrounding us – we are able to achieve things we never imagine we could. This qigong training will develop our ability to perceive the life force that flows through everything in the natural world. Relaxation (improves blood circulation) Relax means slowing down (the mind) so that qi can flow and qi channels can be opened. As people relax, their qi begins to move more smoothly. They will feel more open up, developing a sense of wholeness with the Dao, the universe, and themselves. Self massage – taichi movements are self massages to dissolve blockages (writer’s block), help circulation and increase the harmony of qi. Muscles are contracted and relaxed alternately to gain flexibility and control. The body is thus opened to receive maxium qi flow. Strengthening of internal organs, loosening joints. Qi forms the basic energy in women and men alike. There is yang (masculine) qi and yin (feminine) qi. Certain special practices, especially those for women, were kept secret during most of Chinese history. Now however, they are available to anyone with sincere interest. Some of these exercises were quite elaborate but we will do one which is easy to learn and simple to practice, but extremely powerful. This practice energizes while at the same time drawing energy from the universe into a woman’s body. Stand comfortably, feet apart (shoulder width). Feel your feet root deeply into the ground. Center yourself. Take a deep breath from your diaphragm, drawing the air into your upper dantian (third eye), next into your middle dantian (chest), then your lower dantian (abdomen) and finally farther down into your pelvic region and ovaries. This draws qi energy from the universe into your female areas. Hold your breath for a second or two. You may feel a slight tingling in the area of your lower areas. This is qi. Then as you exhale, let your breath diffuse through your entire body all the way up to your head. This permits the powerful yin qi to energize your entire body as well as your mind. Repeat this simple exercise 10 times. Chinese believe that yin energy begins to rise at noon and so mid-day is a good time to do this exercise. However, it can work nearly as well whenever you can find a few quite moments. As you continue to practice this qigong, you will find it easier to feel the qi build up in your lower areas as you draw your breath in, and the energizing of your entire body as you exhale. There are traditional Chinese theories about the benefits of qigong. Chinese developed these exercises in the hope of curing diseases but now we think of them more in terms of enhancing health. It is interesting to learn something about the theory but don’t worry too much about this because you don’t need to know the theory to get the benefits. We begin with a brief centering exercise: root feet, focus mind, breathe deeply. (Laozi, chp 3: The wise therefore rule by emptying the mind, reinforcing the abdomen, weakening ambitions and strengthening bones). By inhaling deeply, we cleanse our lungs and gather energy from the universe. Imagine you’re by the sea and taking a shower in the gentle sunlight where we draw earth and sky qi into one circular, open-armed movement. We relax by slowing down our mind so that our qi channels will be unblocked and our qi can flow better. During this sun/air bath, we visualize all our pores open, letting the fresh qi flow into our body and the stagnant, negative qi flow out. Look at the Back of Your Heel – This helps get rid of the five weaknesses and seven injuries caused by over-exertion of weak internal organs. The five weakness refer to illnesses of the five yin organs: heart (red, excessive/unbearable joy), liver (green, anger), spleen (yellow, worry), lungs (white, grief), kidneys (black, sudden fear). The seven injuries result from the seven intense emotional disturbances: happiness, anger, sorrow, joy, love, hate, desire (or mood disorders: joy, anger, melancholy, worry, grief, fear, fright). Turning to look at the back of the heel helps loosen up the muscles and blood vessels in the neck and allows qi to flow. By looking at the back of the heel, worries are left behind. Two Hands Hold the Sky – Good for the triple burner (sanjiao) for respiration, digestion and elimination. Fill your dantian (medicine field, energy ocean, where the pill of immortality could be obtained and refined in this kidney area) with the earth qi and let this qi grow upward as your arms raise toward the sky. Then release your breath and continue to exhale as your arms return to the dantian. Bend the Bow to Shoot the Eagle – First, root our feet to center our bodies by squatting down in the horse stance. Keep your back straight and tuck in your coccyx (if spinal cord is correct and centered, qi will reach the top of your head). This strengthens the waist muscles and increases qi circulation in the kidney area. While doing this, extend your tendons and focus your mind. This also strengthen legs and expands the chest. There is a Chinese proverb for Taichi: Tendons long; life long. Tense and Punch – This exercise is to enhance vitality, increase your overall power and rid yourself of stagnant qi and negative thoughts. When your spirit is lifted, your qi will flow better. Raise Hands – Each hand is raised in turn. This stimulates and strengthens tendons and muscles and increases qi circulation in the stomach, spleen and liver. You should feel your hands are pushing against resistance. Repeating it stretches and relaxes the body. Waving Head and Tail – Relieves heartburn (heart-fire) caused by too much hot food (spicy and greasy food which increase internal heat) and drink (caffeinated drink, alcohol), polluted air, insomnia. Heartburn occurs when excessive qi stagnates in your heart. Moving your body from side to side loosens up your lungs and releases excessive qi from your heart, thus putting out the fire. Two Hands Hold Feet – Massage kidneys and increase qi flow in back muscles and spine. The kidneys are where your original essence generates. When you bend forward to hold your feet, you are tightening your body and stimulating your kidneys. Then, when you bend backwards, the stagnant qi in your kidney is released. With this exercise you will probably notice a feeling of being refreshed right away. The Spine Goes Up and Down –This movement smoothes out the qi in your entire body from head to feet. Gather energy from heaven and earth. Like pulling silk or flowing water, energy never broken from beginning to end. Taichi in circular movements stimulates nonstop, alternating yin-yang energy:forward-backward, long-short, high-low, tense-relaxed, open-closed. Twisting movements drill open the qi channels to improve circulation and make tendons flexible for long life. Round movements also help to loosen and relax joints. Alternation of movement of the body and rest of the mind. 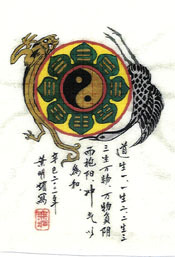 Yin-yang energy: needle hidden inside cotton (pliant but resilient as steel, soft outside while firm inside); pliant above while rooted below; contemplation and movement; concentration with no tension; neck both weak and firm (keep erect and relaxed for qi to reach the top of head and then begin its descent). Repulse Monkey – Retreating movements signify pliant, controlled and powerful reserve. The weilu, gate of tail, is opened, allowing qi to pass up the spine. Thus, even in retreat, the practitioner is full of vital energy in its upward/downward; forward/backward movements. Look at the Mirror – Diagonal circulation of qi. The succession of turns and pivots resembling the left and right movements of a shuttle guides the qi in a circulation that passes diagonally through the trunk of the body. Da Liu: Tai Chi Ch’uan and Meditation, Schocken Books, New York, 1986.